Field View Cottage at Holtby Grange Cottages in Holtby, near York, Yorkshire sleeps 6 people. Holtby Grange Cottages near York are a collection of five holiday cottages; Field View Cottage is the largest of five semi-detached holiday cottages set around a central courtyard at Holtby Grange with the owner living on-site, just outside the small village of Holtby and only 5 miles from York city centre. Hidden down a long private drive and surrounded by open countryside with far-reaching views, this three bedroomed property offers a high level of guest comfort and luxurious extras for a small family or social group. The entrance to the property is from the main courtyard which has beautifully trimmed boxed hedges and a koi carp pond. With shared seating, this area offers a real sense of peace and tranquillity. Upon entering the property you are straight into the open plan kitchen/dining/living room. With a feature brick wall, contemporary wood burner and vaulted ceiling, not to mention the oak kitchen covered with granite worktops, Belfast sink and high end cooking appliances, this property will not disappoint on arrival. The chef in the family will certainly enjoy cooking in this kitchen. The wow factor continues into the three en-suite, zip and link bedrooms. The décor and soft furnishings match perfectly and with excellent quality beds, you are guaranteed a peaceful nights sleep. Outside there is a large enclosed garden shared between all the cottages offering a shaded wooded area, summerhouse with seating, garden paths and a central pond which is surrounded by a fence. Field View Cottage welcomes dogs; they even have their own little welcome pack including dog treats and information on local dog friendly cafés, pubs and restaurants. An enclosed paddock and outside dog shower ensure that your four legged friend also has an enjoyable holiday. Within 5 miles is the historic city of York and its plethora of world renowned visitor attractions from the Gothic York Minster, National Railway Museum, Jorvik Viking Centre and York’s Chocolate Story. If your interests are more towards shopping and experiencing the buzzing café culture and many eateries including Michelin starred restaurants, all of which are dotted along streets that can trace their history back hundreds of years, then there is no better place to base your holiday than at Field View Cottage. The Victorian spa town of Harrogate, 21 miles, Thirsk and home of James Herriot, 31 miles and the seaside resort of Scarborough, 44 miles which are all within day trip distance. You will find the nearest shop 2 miles from Holtby Grange Cottages near York, with the pub 1 mile and the restaurant is 4 miles from Holtby Grange Cottages. Field View Cottage can be booked together with Cozy Cottage (ref UK10717 [Cozy Cottage]), The Granary (ref UK10718 [The Granary]), Owl Cottage (ref UK10716 [Owl Cottage]) and Applegate Cottage (ref UK10719 [Applegate Cottage]) to sleep up to 16 people. Field View Cottage has a step to the entrance. Bedroom 1: With zip and link super king-size bed (can be twin beds on request), Freeview TV, beams and en-suite with shower cubicle and toilet. Bedroom 2: With zip and link super king-size bed (can be twin beds on request), Freeview TV, beams and en-suite with shower over bath, and toilet. Bedroom 3: With zip and link super king-size bed (can be twin beds on request), Freeview TV, beams and en-suite with bath and toilet. Air source central heating, electricity, bed linen, towels and Wi-Fi included. Initial fuel for wood burner included, remainder at an extra cost per basket. Travel cot and highchair available on request. Welcome pack and doggy extras. External utility room with washing machine and tumble dryer (shared with other properties on-site). Large enclosed lawned courtyard garden with patio, terrace, garden furniture, barbeque and summerhouse (shared with other properties on-site). 2 dogs welcome, to be kept on a lead at all times (sheep country). Dog exercise paddock. Bike store. Private parking for 2 cars. No smoking. Please note: There is a fenced pond in the garden, 100 yards away. Holidays at Field View Cottage, Holtby Grange Cottages run from Friday to Friday. Pets allowed at Holtby Grange Cottages - Field View Cottage. For a better idea of where Holtby Grange Cottages - Field View Cottage is, you can see Holtby Grange Cottages - Field View Cottage on the map below. 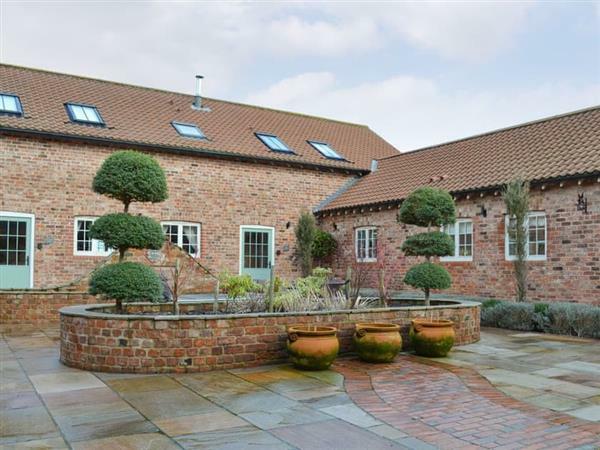 Holtby Grange Cottages - Field View Cottage is in North Yorkshire; should you be on the lookout for a special offer, you can find all the special offers in North Yorkshire. It's always worth checking to see what is on offer at the moment. Do you want to holiday near Holtby Grange Cottages - Field View Cottage (UK10720), you can see other cottages within 25 miles of Holtby Grange Cottages - Field View Cottage; have a look to find your perfect holiday location.